emerging tampa bay architects: Tampa Center for the Built Environment? Tampa Center for the Built Environment? A lot of you may not know that our local AIA chapter has been exploring the possibilities of leading a team to convert the old federal courthouse in downtown Tampa into a "center for the built environment". This idea has been in the works for months but is now starting to get some real traction as AIATB will sign a letter of intent with the city. AIATB now has 6 months to perform due diligence to determine if the concept is feasible. The adaptive reuse concept for the 102-year-old courthouse building includes office space for AIATB and other organizations, an urban-planning research center, galleries, retail and restaurants. You can read more about this at the St. Petersburg Times and at the Tampa Tribune. What do you think of the concept? What things would you like to see go into the building? I think that this may be a great use for a building that has seen many proposals come and go. It is certainly an opportunity for AIATB to step up and show some leadership in the community. I would like to see the program include a shared studio space for young architecture firms where people could rent desks and have access to shared facilities like conference rooms, voicemail, plotters, etc. Something along the lines of what LTL Architects had in NYC. In its heyday, the collaborative studio with a storefront presence at 147 Essex Street housed the emerging firms LTL, L.E.FT, nArchitects, Architecture Agency, Miloby Ideasystem, and Briggs Knowles Architecture + Design. Essentially, 147 Essex acted as a business incubator for young architecture firms. AIA Tampa Bay has been talking about the courthouse for quite some time. Now it seems official. Pete Karamitsanis, AIA Tampa Bay president-elect, first discussed in March of moving AIA's office and creating a "design center" in the currently empty downtown courthouse. The idea is ambitious as well as essential. Having a design center in downtown, and having a collective of individuals focused on the built environment would act as an incubator of ideas and could possibly do great things for the city. I have to agree. This is a wonderful historic building that is being ignored, and these proposed programs would be very appropriate for it. I hope it's a proposal that is realistic and can be financially sustained. 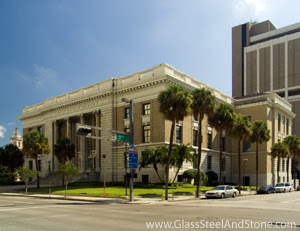 "We are excited to share the news that the AIA Tampa Bay board has approached the City of Tampa about leading an effort to bring new life to the now empty historic Federal Courthouse building in downtown Tampa. Mayor Iorio has agreed to allow the chapter to take 6 months to assess the cost of renovation, find funding sources, identify tenants and to create a business plan to operate the building long term. The chapter is currently awaiting the final letter of intent from the City and we expect to have the ‘go-ahead’ by November 1st. The idea is to create The Center for the Built Environment to serve as home to AIA Tampa Bay along with many other organizations related to the built-environment. Chapter leaders have been brainstorming for many months about possible uses and ways to pay for the renovations. One idea is to bring in a university with an architecture program to have an Urban Design curriculum in the building. Other associations related to A/E/C will be invited to have their headquarters in the building. This would allow for the various groups to share spaces such as classroom and meeting space, a larger event area - possibly in one of the courtrooms. The spaces could also be rented out for private functions to generate revenue. Also, there would likely be a museum type space for exhibits and displays. Another idea is to have a Design Center in the building where manufacturers have products on display so designers can preview a variety of products in one location. Other possible tenants include a restaurant or private club, a reprographics company and a construction bookstore. The possibilities are endless and are about to be explored more in-depth. To fund the project the committee is looking at grants, tax credits and the donation of services from the a/e/c community. The remaining costs would likely be covered by a construction loan which could then be paid back with rental income from tenants. The committee will be calling upon a wide variety of a/e/c related businesses that have built successful companies in Tampa with the hope that they will see this as a great way to give back to the community while realizing a tangible result. Donors will be recognized in some way within The Center. This news may not be news to you! There was an article in the St. Pete Times and the Tampa Tribune today sharing the news. We would have preferred to share the news with our membership before it became public knowledge. Unfortunately, we were unable to share any information prior to the Mayor accepting our proposal. We are still waiting for the final letter of intent from the City and expect to have soon. We are very excited about this effort as it is in line with our mission to be The Voice of Architecture – Dedicated to our Members and the Quality of the Built Environment. We are confident that if this plan comes to fruition, it will shine a bright light on the value of planning, design, construction and architecture within our community. Stay tuned! We will be keeping you informed as things progress." I think it is a great idea, I am happy AIA is stepping to the plate. The idea reminds me of International Market Square (IMS) I visited in Minneapolis.